Vintage Hamilton Watch Restoration: Nothing Runs Like a... Hamilton? Nothing Runs Like a... Hamilton? When is a Hamilton watch not a Hamilton watch? When it's a Vantage watch. In the 1960's Hamilton bought Standard Watch Co. and used their capabilities to make a new line of models called Vantage. 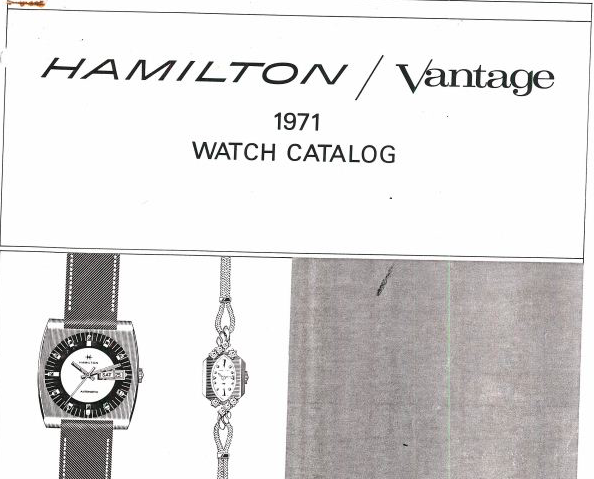 The Vantage line was included in the Hamilton catalogs of the 1970's. I suppose you could say that Vantage watches are to Hamilton the way Saturn was to General Motors. If you recall the Saturn brand of cars, they were introduced at a much lower price point than higher-end GM brands like Buick or Cadillac. Still decent cars, I suppose, but made with less expensive materials, etc. to keep costs down. Vantage watches are their own brand and to equate them to Hamilton wouldn't be a fair comparison. They were simply less expensive watches meant to compete at a lower price point than Hamilton and at retail locations you might not find Hamiltons in. Vantage watches were priced about 1/2 the cost of "similar" Hamilton watches. For example, take the Hamilton A-506 - it was a nice, less expensive automatic model priced in 1971 at just under $70. 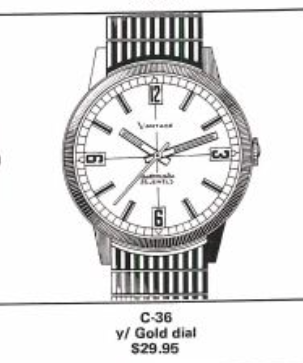 Also in 1971 you could consider the Vantage C-36 with a 17 jewel automatic movement, but it was priced at just under $30. That was still about $180 in today's dollars - not exactly a dollar-store watch by any stretch. With the exception of some of the earliest pocket watches, Hamilton didn't make models with less than 17 jewels. Other makers like Elgin, Waltham, etc made watches with 15 jewels or even 7 jeweled grades. 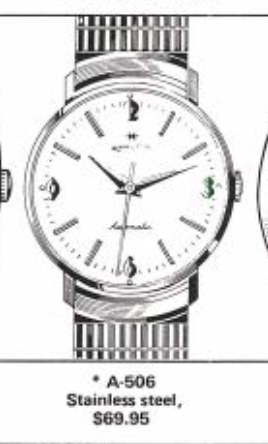 You will find that some Vantage models had movement with 7 jewels, so the quality of the movements weren't always at the level that a Hamilton-branded watch would have. You will also find the Standard Time movements used in some of the military watches that Hamilton produced in the 1970's. Personally, I don't collect Vantage watches, mainly because watches from the 1970's don't really interest me that much. However, I recently came across one that caught my attention because it also had another great American brand that I'm pretty loyal to - John Deere. I couldn't resist it and I'm the only one who bid on it so I pretty much stole it for about $10. As received, it looks to be in good shape. The case has some minor dings and the crystal is very scratched up but it doesn't look too bad in my photo. The case has a base metal bezel and a stainless steel back. The crown has been worn down on the side so it's showing a brass color. When the back cover is removed a brass-like dust cover is revealed. It lifts straight out. The movement is a Standard Time 444. It's based on a Durowe 7410 grade. Durowe isn't a maker I come across very often in my Hamilton travels but this movement looks like a more-jeweled version of the 7 jewel Durowe movement in the Hamilton Mil-W-46374B. Two dial foot screws secure the dial to the movement and once the dial and hands are removed you can see the calendar complication on the front of the main plate. This is a mechanism that I'm not familiar with so I'll be very careful not to lose any hidden springs while I disassemble it. Yup - there are two springs under the cover. With the front cleared of parts I can flip the movement over and strip the backside. The barrel bridge comes off first. This watch is similar to the ETA grades used in the Hamilton like like the 671. With the balance removed, there are some figures stamped into the metal. The 7423 with a D means this is a Durowe 7423 grade. The 21600 is the beat rate... much faster than the 18000 that most vintage watches had. The shield with INT is the symbol for Ébauches S.A, aka ESA. They were a conglomerate or holding company of many watch companies and they purchased Durowe in 1965. ETA, Valjoux, Unitas, A Schild, and many others, were are part of ESA until the Swatch group bought them in the early 1980s. While everything is being cleaned I will measure the old crystal so I can get out a replacement. I need to convert 1.222 inches to millimeters by multiplying it by 25.4. A 31.0 mm PHD crystal will do the trick. Getting the train wheels back in place is the first step. Next on is the pallet fork and it's bridge. The mainspring barrel and the barrel bridge go on next and the movement can be wound up a little. I had to do a little tweaking to get the beat error in line but things are looking good now. I moved into my light tent to reassemble the front of the movement - that way if the springs disappear on me they won't fly off too far. The dial goes on and then I slowly set the time forward until the date changes. Then I can reinstall the hands at 12:00 midnight. I replaced this worn crown with a new stainless crown and with a fresh lizard strap this watch looks as good as new. You cannot tell from the outside that this isn't a Hamilton watch... or is it? This is such a treat to see the process a talented watchmaker undertakes to restore a watch. I will be reading often so I will be, at my age, something more than just an enthusiast!